1. The rise of Nio: Electric car company Nio (NIO) appears to be headed for another banner day on Friday. The Shanghai-based rival to Tesla (TSLA) jumped a staggering 76% in New York on Thursday. At one point in the day, the stock was up 92%. 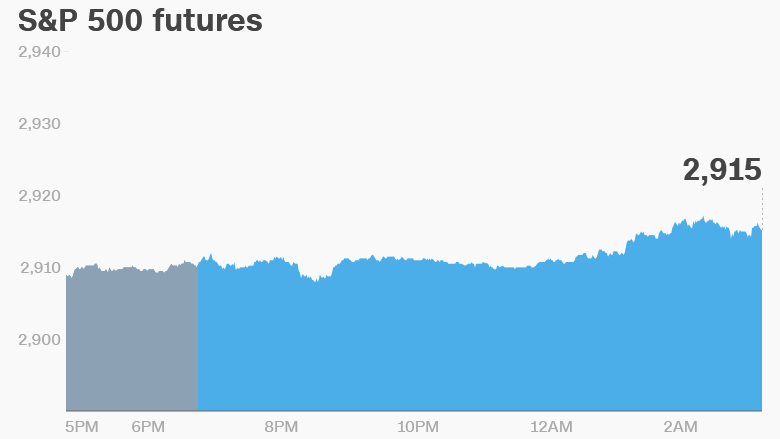 Futures pointed to another spike on Friday. During its trading debut Wednesday, Nio stock closed up 5%, having plunged as much 15% earlier that day. The strong close to the week is remarkable after Nio had to scale back its ambitions for the size of its IPO. It raised $1 billion from the offering, at the bottom of its price range. It was hoping to raise as much as $1.8 billion. 2. The future of Goldman Sachs: David Solomon officially takes over for CEO Lloyd Blankfein on October 1, and he's already making his presence felt. The incoming CEO of the investment bank has announced that Chief Financial Officer Martin Chavez will be replaced by Stephen Scherr, who had been in charge of the consumer bank. John Waldron, a longtime lieutenant of Solomon's, has been named new president and chief operating officer. The management shakeup announced Thursday helped boost shares in Goldman Sachs, which had suffered 11 consecutive days of losses. Solomon has his work cut out for him. Goldman Sachs (GS) is the second-worst performer on the Dow this year, and it recently suffered its worst ever quarter for trading commodities. Another headache: regulators recently imposed limits on the company's ability to ramp up dividends and buybacks. 3. Lehman anniversary: Saturday marks the 10th anniversary of the collapse of Lehman Brothers. The investment bank's demise set off a chain reaction of bank failures that required unprecedented US federal action, and led to a global financial meltdown. On paper, the global economy has mostly healed. But many workers have not yet felt the benefits — real wages in most of the world are still below the pre-crisis levels. European markets posted gains, following a mostly positive trading session in Asia. US oil futures gained 0.7%, recovering some losses suffered Thursday. The Dow Jones industrial average closed 0.6% higher on Thursday. The S&P 500 was up 0.5% and the Nasdaq gained 0.8%. 5. Companies and economics: Dave & Busters (PLAY) will release earnings before the open. Apple's (AAPL) new iPhones are now available for pre-ordering. The US Census Bureau will publish its retail sales report for August at 8:30 a.m. ET. The front pages of British newspapers were dominated by a dire warning from Bank of England Governor Mark Carney to government ministers. The central banker reportedly repeated his warnings that a disorderly Brexit could slash house prices by a third and cause a sharp economic downturn.